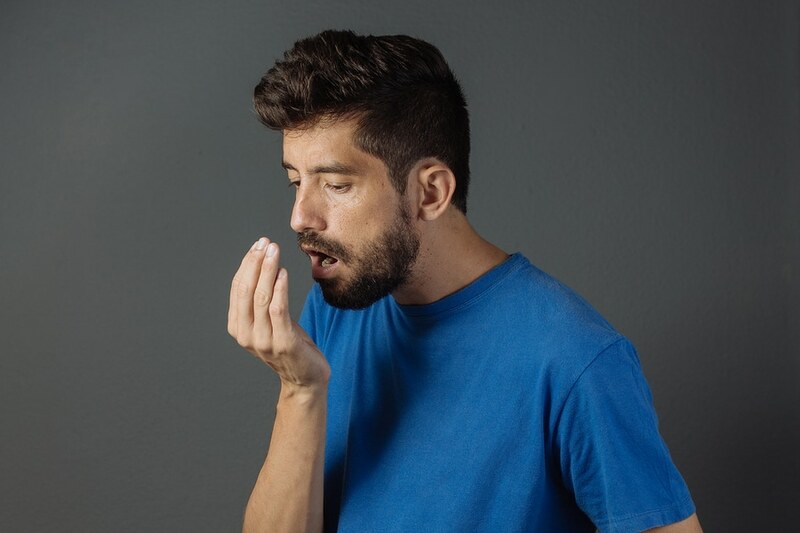 Bad breath is something we can all relate with; Whether it is eating some type of food that has this crazy smell, or the feeling we have in our mouth from not eating for a long time, or when you stay too quiet without talking for a very long time. No matter the case, we have all being there one way or the other. This type of bad breath does not really come as a result of any underlying medical condition. The bad breath that may result from a medical condition is what is called halitosis. This is a persistent condition that requires more than just brushing twice in a day or a piece of gum to get rid off. It could be a sign of something more serious. Roughly 50% of Americans are suffering from a form of bad breath. The same statistic may hold true for other regions. Whether you are experiencing bad breath as a result of the food you eat, stress or something more serious, the following tips will prove helpful. According to dentists, you are to brush your teeth at least twice in a day. In the morning, and before bed at night. If you haven’t been doing this, especially at night, this may just be one of the reasons for your bad breath. This is important if you want to stop bad breath, as you will be able to get rid of food particles and bacteria lingering in your mouth. If brushing twice in a day is not enough, you may want to keep a brush handy at the office. Most of us remember to brush but forget to floss. It is very possible that after you brush, food particles may still get stuck in between your teeth. And since it is still inside your mouth, it will contribute to bad breath. Flossing is one of the ways of stopping bad breath as it removes food particles as well as plaque and bacteria. Not flossing will be doing you much harm, and even more to the people within talking distance. You don’t want that. Brushing your teeth is not enough. That is just cleaning one part of the whole. Remember to floss, preferably twice a day. This is another easily forgotten part of our mouth. Your tongue is a good place to breed bacteria since it is always wet, warm, and frequently flooded with food and drink. It is very important to clean your tongue using a tongue scraper. Do not brush your tongue. Using a tongue scraper, clean the tongue especially the top portion to remove dead cells, bacteria and coating. Do not forget the back of the tongue too. Most people think that provided they can brush, floss and scrape their tongue, there is no need for a dentist. Absolutely not correct. If you have bad breath, it will be wise to know what is responsible for it. Most bad breath comes from the mouth. It is therefore essential, that you fix appointments with your dentist at least twice a year, to clean and check up your mouth. This is because bad breath can be caused by cavities, cracks, and infections which home care alone will not get rid of. Identifying these problems early will help get rid of them quicker, keeping you bad breath free. This can provide amazing benefits. Apart from the fact that it is handy, it keeps your mouth clean and fresh. There a lot of mouthwash, differing in flavours, ingredients and benefits. You will want to keep an eye out for two components: zinc and chlorhexidine. Zinc reduces plaque, while chlorhexidine fights bacteria. If you have a strong bad breath, using mouthwash is the quickest way to get rid of it, even though temporarily. Your diet cannot be overlooked. Some times just knowing what to start with while eating, and knowing what to eat last does the job for you. You have to be conscious of the kind of food and drinks you take, and also your type of diet. Foods that fight bacteria are a great way to end your meal. Nuts have proven to be really helpful too. You can chew on a handful of cloves, aniseeds and fennel seeds. They contain antiseptic that help fight halitosis- bacteria. Related: Are Edible Insects a Real Thing? These three culprits are major contributors to bad breath. They cause the mouth to be dry and leaves an odour which lingers in the oral cavity. Research has shown that saliva has an essential role in your mouth. It moistens and neutralises the acid produced from bacteria and plaque. It also helps to wash away particles of food and cleanses the teeth. Taking too much alcohol and coffee kills the good bacteria in your mouth, and produce bad bacteria that contribute to bad breath. To stop bad breath, it is advisable to avoid alcohol, especially ethanol. It reduces the amount of saliva in your mouth by its naturally drying effect. This increases the amount of saliva in your mouth and prevents your mouth from getting dry. Dry mouth is one of the primary cause of bad breath. When picking on gums, go for sugar-free gums that have xylitol. If you wear dentures, take them off every night, and clean them up before going to bed. This gets rid of bacterial build up and particles of food. You can get a toothbrush specifically for cleaning your dentures. I hope you all found this piece informative and educative? What measures have you taken to help you stop bad breath? Care to share your experiences with us? Use the comment box below.